I'm thinking of getting 2 hi hats, most of my friends get like 2 rides, and 2 china cymbals and stuff like that, I'm really not rushed to get them yet. I've always wanted 2 hi hats, one to use main control over my left foot on and one close to my right hand (The second Hi hat set would be permanently open to where it makes a loud buzzing sound of the hats crashing together. Chris Adler has 2 hi hats. Anyone have 2 hi hats? I got it from uh, the get wet shop! I am saving my pennies for the very same thing. Two hats will let you get some cool ride/hat grooves going on the right side, or get you into a hat rock groove without cross-sticking. Two Hi-hats is great if you want to explore, and perfect your open handed playing skills, giving you the ability to move around the right side of your kit more freely. depends how big your set is. If it's only a 5 piece with a bunch of cymbals, then there's really no point in having two high-hats. sure it could look cool, but in the end, the difference is purely aesthetic. if you have a bigger set, (say 8 or 9 piece), then it could prove useful for moving around the set. If you are part of the former category, it would be more productive, (art wise), to invest in some roto-toms, cowbells, or even a glockenspiel. a quick look into my mind. I love the feedback of this forum, inspires me. What I'm worried about is where it would go on my set, my friend has a 6 piece with like 8 cymbals, and he doesn't have any trouble with his cymbal set up, I don't have barely any cymbals outside of traditional standards and I don't know where to put anything! Here's my set, any suggestions? Take your two floor toms and seperate them a little, then slide the high hat in between them so you can reach it comfortably, if its hitting your ride cymbal, raise the ride. However if your planning to use the footpedal on the hi-hat then thats another story. 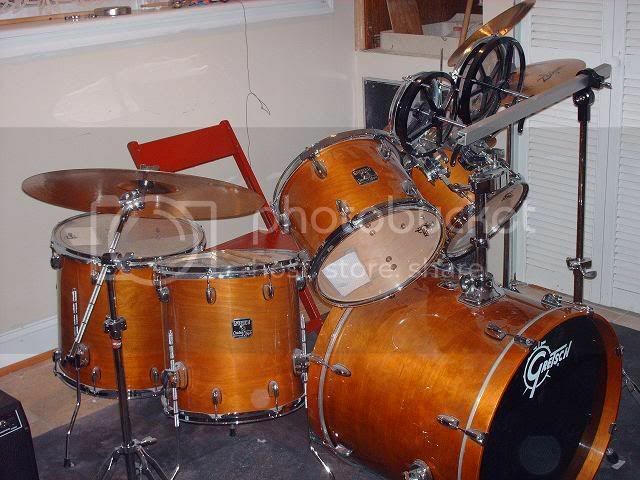 also try putting the roto toms over your hi-hat instead, that should really give you some space for your cymbals. if you don't mind the change, I'd flatten the rack toms you have, the angle that they are at kinda makes it so nothing else can be near them and you'll probably find you can play faster when you flatten them out as well.